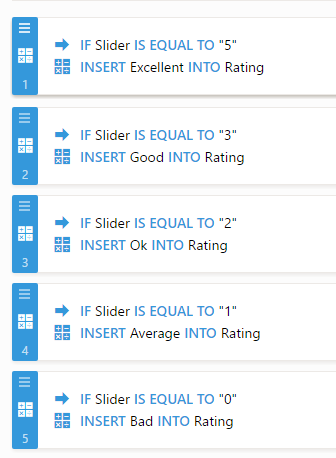 Is it possible to display text value for a Slider? Slider-Widget: How can I integrate slider with word-output? E.g. bad, average, ok, good, excellent? Unfortunately, it is not possible to set text values for the slider widget. However, a workaround can be setting up conditions on the form for the Slider field to display the text value in a separate text field. Please see the demo form below if that works for you. Please feel free to clone the form to your account. Please get back to us if you need any further assistance. We will be happy to help.